Enjoy music, shmoozing, L’chaims, Kids craft and Pizza making! Gourmet Pizza toppings and Spice bar! Salads, Fies and More! Wine and beverages and Dessert no doubt! SPECIAL WOODWORKING WORKSHOP FOR KIDS! Combine Wood, Nails, Glue & Jewish Spirit! Make your very own mini Sukkah! For display, for play, for endless opportunities of imagination! Don’t miss our embellishment bar with choices of fabric for table cloths, carpets and more! Make mini tables, chairs and decorate to your hearts delight! 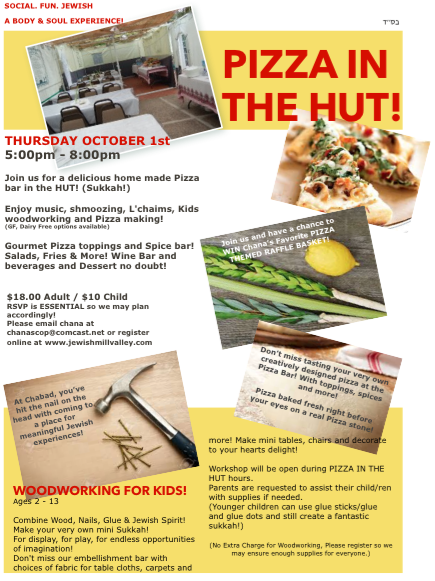 Workshop will be open during PIZZA IN THE HUT hours. Parents are requested to assist their child/ren with supplies if needed. RSVP is ESSENTIAL so we may plan accordingly!